6 Floral Inspired Wedding Details We Love! We love the elegant feeling of this champagne v-neck bridal gown. The metallic floral appliqués are light and beautiful and add just the right amount of romance to the dress. Flowers, flowers... we can't get enough of them! We just can't get enough of these gorgeous invites designed by Lynn Graham Designs. The aquamarine and coral pair so beautifully together and the sweet floral details are both romantic and subtle. Invitations are a wonderful place to incorporate floral details to your wedding vision. These edible flowers look oh-so-beautiful and oh-so-delicious. We love the simplicity of this cake with three of the four tiers smooth and understated, and the second to last tier exploding with delicate blossoms. 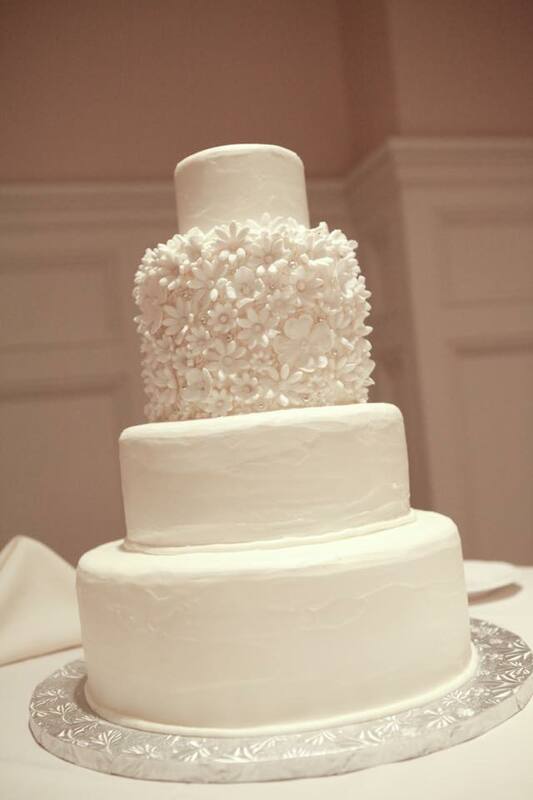 Fresh flowers are always an option for a cake, but we could not help but drool over this frosted stunner! We love the bold look of this branch lighting by Revelation Productions. It creates such a dramatic effect that would be sure to impress guests and make any wedding theme simply over the top! These elegant bridal shoes are just too pretty. They have crystal floral detail on the sheer pointed toe and delicate criss-cross straps. The perfect touch of sparkle and floral! Who doesn't love chocolate? Especially floral themed chocolates! These delectable treats are perfect for guest favors. Simply sweet.